That image isn't that far off. Replace blimps with either Macy's day parade balloons or helicopters and it is a fare assessment. "That image isn't that far off. Replace blimps with either Macy's day parade balloons or helicopters and it is a fare assessment." Steam passenger ships? No container terminals on the Jersey side? Truss bridge all the way across the bay from Staten Island, with swing component at the ship channel, instead of a suspension bridge at the Verrazano Narrows? Supra-Gilded Age skyscrapers instead of Art Deco Chrysler buildings or steel and glass towers? A (stone pillared, no less) suspension bridge where the Brooklyn-Battery tunnel is? Yes, the artist got the idea of continue building up and common, convenient flight right. But Rick is correct that he totally relied on the technology of his day for the details. Rick is correct that he totally relied on the technology of his day for the details. On the other hand, could he really do anything else? If he'd drawn those ships without chimneys, would anyone still have taken the drawing seriously? The trouble is always that the advance of technology is so hard to extrapolate. Just a small detail (microchip!) that on the first glance doesn't even have anything to do with the area of technology you're trying to describe, can change the whole picture. In other words, can we ever imagine the future as anything but a more advanced present? I didn't see it but, to ummmm extrapolate, I'd say that one of the Truest things about human affairs is that they are always, always, *always! * cyclic (hence the word 'Revolution', and the wheel on the Indian flag etc). Any future guess will be more likely to be correct if it ditches the contemporary and extrapolates from something fairly applicable from the past (hence my pretty scornful attitude towards the applicability of neo-liberalism in space... at least until its time comes back round again: it's in a queue... and why I always consider 'hard' and 'plausible' to be in Big inverted commas). I agree that the greatest changes are the ones we don't anticipate. Lets imagine that technology like "space fountains" becomes economical. 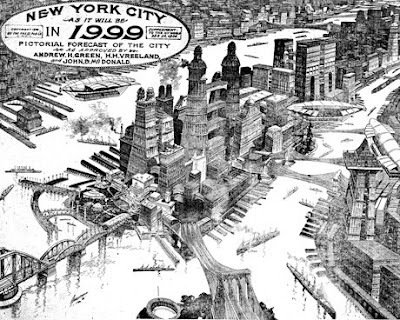 New York will change as massive loops of rapidly moving mass are buried in the ground to store off peak energy, giant "suspension" bridges using momentum trusses loft traffic totally over the metropolitan New York area, momentum trusses support a dome over Manhattan island and high speed transport magneticlly coupled to the streams of mass in horizontal "fountains". Now this is the very visible result of one form of macro-engineering, but there will also be thousands of smaller knock off effects from the various engineering advances required to make "fountain" technology work being embedded in lots of other items. (super capacitors, high speed switches, ultra high voltage equipment, etc.). In fact, even if the actual "fountains" never take shape, the various technologies will still be infiltrating the rest of the world. Remember that while cars were predicted for centuries, no one predicted strip malls or drive in movies. your predictions (no matter how clever) will be totally off the mark in many ways. Once again, this is an artifact of the "local knowledge" problem; there will be lots of subtle and uncatagorized information that someone close at hand can take advantage of, but which is too difficult or time consuming to catagorize, send up the chain, react to etc. in any effective manner (as a futurist, author or game designer, you don't even have much "real" feedback anyway). Some time around 1930, a bunch of famuos people were asked for their predictions for the year 2010...of all those asked, Henry Ford refused, saying something to the effect that the only thing predictions do is to provide a source of amusement to those living in the year that the preditions are made about. That being said, unless disasters strike, cities don't usually change that much, even over a century's time. There are exceptions, but most of those are related to rapid growth or a drastic change of circumstanses (the railroad comes through, or stops comeing through; the mines play out, the harbor silts up, etc). I'm going to say that cities, in 100 years, will either look mostly like they do now, with only a few details changes, like many more steel-and-glass building, and a few more light rail lines; future cities will look like something out of a sci fi show (hopefully more "Star Trek" than "The Jetsons", or "Mad Max"); or, the city of the future will look like big grey labyrinths with tunnels and cave-like spaces so anonymous that you can't tell whether you're in Tokyo, New York, or Madrid. Personally, I'd pick the first one; while I have been known to be wrong now and again, I'm pretty sure that barring disasters, most cities will look a lot like they do now, with just a few details different (less older builings, more newer building, minor changes in transportation, etc), but more or less recognizable. Now, the only things that could change cities so drasticly as to render them unrecognizable (discounting disasters that wipe out huge swaths of urbanscape) would be a massive architectual revolution (like the explosion of skyscrapper building in the early 20th century), a technological breakthrough so compeling that most building are replaced with new ones incorporating the new technology; or, a social shift that demands a complete redesign of the urban landscape. So, baring us from moving underground, into the sky, or into megastructures, cities will evolve slowly, puncuated by spurts of boom and bust, changing little over the course of a century or more. The lifetime of cities can be measured in centuries, or even millinia, so I think that 100 years may not normally be long enough to detect more than a few details in a city. Once you get to street level, however, things might change dramaticly over the course of a century. Rick, Blogger is acting up again; please delete the duplicate post. Thank-you. Always good to re-read Neil Postman, when it comes to this kind of thing [referring particularly to Thucydides' point, regarding the actual, unforeseen, impact of the car/tech]. And the biggest error is only ever in putting a date on your prediction... don't do that and you'll probably be right at least once, somewhere, somewhen... the SFnal changing the Year 1 on the calender is always as wise as wise can be. Henry Ford was right - predictions of the future are almost entirely for entertainment value. One other thing about the future is how many tropes from the past refuse to die. We are constantly bombarded about people living in poverty in North America, yet the vast majority of these "impoverished" people have a car or access to transportation, housing, television(s) and internet access. Relative to other North Americans, these people may be in the bottom quartile (or whatever slice bureaucrats choose), but compared to historic data in North America or the rest of the world today, they are living like kings and queens. So science, technology, economics and politics has essentially banished poverty from our midst (with few and remarkably limited exceptions), but the massive bureaucracies, programs, charities etc. live on. We still have comparisons to the conditions of mid Victorian England from time to time to "justify" these programs in Canada, evidently, Charles Dickens is still a modern day advertisement for the NDP. The point is not only is the future not being looked at in a "sensible" fashion, but neither is the past. Most readers of SF not only like the entertainment of "what if? ", but I think also hope fr a better or at least different future, yet the starting points we are picking (or being shown to us) are actually not realistic at all. At my age, I remember the euphoria of Apollo, when our school simply shut down for a few hours and everyone watched the landings on television. I remember Stagflation and the gradual loss of optimism as the 1970's progressed. I remember learning economics at the dawn of the Reagan revolution, and wondering why the Keynesian economics lessons being taught in the classroom had no relation to what was happening outside the window. I have lived through the introduction of the PC and Internet, and watched how the frictionless motion of "bits" has overtaken established social, economic and political structures. This is just from the late 1960's to today. Very little SF has even come close to anticipating he real future. Of all the SF I have read (or watched), perhaps the only novel that even came close was "The Shockwave Rider". All our speculation here on Rocketpunk is quite fun and interesting, and we may glean a few germs of wheat in all the chaff. So long as we think of this as speculation and entertainment (and remember to distiguish between the Rocketpunk future and the plausible midfuture(tm)), then we should do OK. In the first chapter of the space patrol, Matt rides a bus where there's a TV-screen with advertisement running, while telling to his new friend that he left his phone in his bag so his parents wouldn't call him all the time. While none of the rest of the space patrol ever came or will come to pass, that little snippet sounds like taken right out of todays live. We do have buses with TV screens running advertisements, and we do carry phones that we carry in our pocket and that go on our nerves every now and then. At least a little bit of the future has come to pass after all. 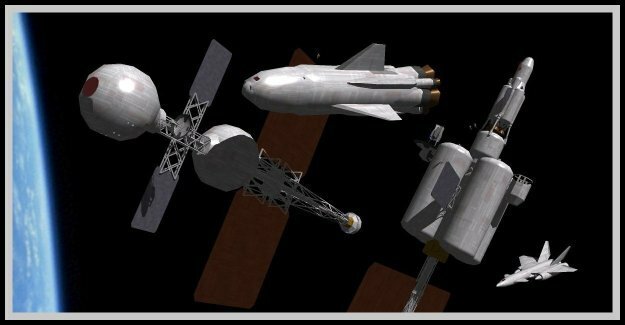 "While none of the rest of the space patrol ever came or will come to pass, that little snippet sounds like taken right out of todays live. We do have buses with TV screens running advertisements, and we do carry phones that we carry in our pocket and that go on our nerves every now and then. At least a little bit of the future has come to pass after all." But that prediction was for the second half of the 21st Century, while in reality it would be valid for almost anytime after about 2005. But don't forget that *relative* poverty is an absolute core human thing, psychologically, and we compare our status to our cultural, extant group, not the past. Remember the experiments with chimps and apes (and cats and dogs etc) where a group was all treated exactly the same (in terms of generous treats), then separated. One group received the same level of treats, the other group received more treats. If the group receiving the same (perfectly comfortable) amount as before could see the group receiving more, then it exhibited all of the problems and behaviours of being in poverty: it's a pretty core mammalian thing (so pretty easy to see where it comes from, as an evolutionary attribute). "But don't forget that *relative* poverty is an absolute core human thing, psychologically, and we compare our status to our cultural, extant group, not the past." But we're not talking about the past. What we're talking about is ignorance of contemporary reality -- often wilfull ignorance. Very few people in North America live inaything like the conditions that are absolutely common in much of the rest of the world. For example, people that are exercised about street people in the US and Canada would be shamed by Mombasa, Kenya, or just about any other big city in sub-Saharan Africa. It's not just marginalized and underserviced behavioral health cases in those places, it's whole families, for their entire lives. Yet -- and here's where the wilfull part comes in -- they can't all be ignorant of conditions in the rest of the world. There's enough media coverage, and at least a few of them travel outside of the country. So there must be a good number of them who intentionally refuse to integrate the human condition outside of North America into their worldview. It would get in the way of their self-righteousness. @ Tony: Yeah, totally - that's what I meant by 'and we compare our status to our cultural, extant group' (with 'the past' being a separate bit). Humies will always be tribal, and a nation is pretty much the upper limit of what folks will identify with (at a core level) as 'my tribe'... even that's pushing it in most cases; and abstracts like 'humanity' never cut much ice (again, on a core level, which is where it really counts). Back to Neil Postman again: information value = action value: even with the best (tribe-transcending) will in the world, there's not much that the citizenry of a sovereign state can do to help the citizenry of another sovereign state, thousands of miles away.... So they do the time-honoured 'charity begins at home' thing, as is natural. I understand that when people actually try to concretize "humanity", they mostly wind up meaning people they can see and touch. But to those of us that have actually been to the rest of the world -- those of us who have seen and touched the "other" -- it gets a bit tiresome to hear about how bad it is at home, when we know it really ain't all that bad there at all. The problem with Postman is that he spoke in absolutes. It's simply not true that inactionable information has displaced actionable information in people's lives. The proportion of actionable information has decreased as the overall cost of information has gone down. But that's one of those things that literally is a feature, and not a bug. Also, as the cost of information has plumetted even further, the tyranny of distance over action is starting to break down. If somebody has something you want, but they're on the other side of the country, you can meet on Ebay, Amazon, B&N, wherever. Actually, distance has become almost irrelevant for transactions that are fundamentally based on information. Web auctions and markets are distance independent. That tchotchke on Ebay could be across town or across the country. Or, if you know you're looking for something local, Craig and Angie can help you out, or you can turn to one of the numerous information aggregation services that fall under the rubric of "local search". IOW, Postman executed a drive-by on a transitory condition, and sold it as a profound insight. Tony: Aye, I know exactly what you mean. @ Tony: Oops: My last post was in response to your last but one, not the Postman one (which I haven't read yet). "in my setting the 'good guys' consider any social system that doesn't have a Diogenes in it is an abject failure. :)"
Great Ghu! Hopefully only in the role of a scold and natural counterballance to happy-shiny optimists. As critical and contrarian as I can be at times, I wouldn't want to live in a society that has undermining its own instiutions as a concrete objective. You're right about his absolutism, which I tend to see as hyperbolically overstating his case so that the mass-media-heads might be able to get his point... I'm quite sure that he would rather not have to. I think that he's more correct now than he was then: yes, everything's set up now for Buying Stuff (which is cool, as a part of the human experience), so infotech has really helped there, as you say... buuut; how much of your average local or national 'news' can you do anything (meaningful, or even at all) about? I'd say that for the first time in history, practically all ignorance (about the big stuff, not arcana) is now wilful ignorance, since there are so many decentralised info sources, that can be accessed so quickly and conveniently... but the majority prefer the centralised info sources, and even if they didn't; what can they actually do with the real info? So it effectively becomes trivia, however important, and leads to a feeling of impotence. "I wouldn't want to live in a society that has undermining its own instiutions as a concrete objective." I actually would: unchallenged mono-ideolgy is a cultural/intellectual/artistic stagnating wasteland... as we can see, post Berlin Wall coming down. I am **certainly** not a Marxist, but without the thesis, antithesis, synthesis, thesis (which is an antithesis of the current synthesis) etc process, everything worthwhile in humans withers. I'm not convinced that accurate knowledge can ever be negative -- or positive. It just is. What one does with the knowledge is what's important. Postamn's argument, boiled down, is that it's a bad thing to know about distant things that can affect your life, while ignorance is bliss. I'd have to disagree with that. One may not be able to do much to affect what happens far away, but knowing it is happening gives one the ability to act proactively on the local level, to dela with the consequences that may ultimately ensue. If you want to say that information overload and infromation quality are issues, well, okay, so what? When have they ever not been? It's a luxury to have multiple, contradictory channels of information, not an imposition. Who said anything about mono-ideologies? Diogenes didn't live in a monlithic society, and we certainly don't. Even specific institutions are subject to competing ideologies, as anyone who follows politics can attest. As for why Diogenes survived while Socrates didn't, I think the answer is self-apparent. Diogenes lived in a bucket and played with the dogs. Socrates Corrupted the Youth (TM). Before looking onward to the future, let's take a brief look back: "In any case, the 21st century is undeniably the century (that) science fiction built -- if not in utter hands-on reality (though even that proposition is debatable, given the inspiration the genre has provided for influential scientists and geeks), then in the public imagination. Since the birth of genre SF in 1926, and for almost the next 75 years, simply to set a story in the third millennium AD was to signify extravagant extrapolation and a futuristic, far-off milieu when flying cars and food pills would reign -- or dystopia would prevail. The year 2010 is automatically one of yesterday's tomorrows. "writes Paul Di Fillippo, in "Is Science Fiction Dying?" Aw heck, let’s add one more preening! I'm quoted in this BBC article: Futurology: The tricky art of knowing what will happen next: "In more recent times, author David Brin, in the 1989 novel Earth and in his other works, predicted citizen reporters, personalised web interfaces, and the decline of privacy. "The top method is simply to stay keenly attuned to trends in the laboratories and research centres around the world, taking note of even things that seem impractical or useless," says Brin. "You then ask yourself: 'What if they found a way to do that thing ten thousand times as quickly/powerfully/well? What if someone weaponised it? Monopolised it? Or commercialised it, enabling millions of people to do this new thing, routinely? What would society look like, if everybody took this new thing for granted?'" "...but without the thesis, antithesis, synthesis, thesis (which is an antithesis of the current synthesis) etc process, everything worthwhile in humans withers." In histriography Marxism is not usually that complex (but sociology, and worse, postmodernism is). Actually, no, postmodernism is just stupid and self defeating. Yes Tony, you can say that the West's problems are nothing compares to other regions in the world, but I would like to add the obvious qualifier that for every hell-hole, there is usually a place of reasonable sanity nearby. Ghana, Kenya, South Africa and (nowadays) Rwanda are next to hotspots as an example. "Yes Tony, you can say that the West's problems are nothing compares to other regions in the world, but I would like to add the obvious qualifier that for every hell-hole, there is usually a place of reasonable sanity nearby. Ghana, Kenya, South Africa and (nowadays) Rwanda are next to hotspots as an example." Ever been to Kenya? I have. That's why I mentioned Mombasa by name as a place that is inarguably worse than the worst we have to offer in North America. I've been to East Asia, Africa, Southwest Asia, the Philippines, and Australia. Of those places, the Japanese and Australians live most like North Americans. It goes downhill from there. Even in South Korea, country life can be considered quite impoverished compared to what the average North American farm family experiences. And that's considered normal, much as the rural life my parents experienced in the 1930s and 40s was considered normal, though now it would be considered poverty of the worst kind. I know I've thrown myself in the hot water here, but I've little time to comment, so I'll be brief. I always look for sign for optimism, and signs of similarity in countries, (as well as positive differences). Signs of middle classes, with decent purchasing power. Just small community of a few hundred such people would do as a sign of optimism. I just can't imagine the non-West entirely as a mire of low living standareds and misery- there have to be some hope spots. Mostly as mire, but not entirely. Yes, billions die in famines, LRA raids, AIDS epidemics, and natural disasters. There have to be some hope spots, just afew. I'm sorry if I'm sounding naive here- I make it a point not to visit a country until I know the language, so I'm appauling at going abroad. From the little I've seen, I have seen misery and a little hope (immigrants from North Africa who end up in Italy tell some haunting stories by their expressions). If I assume misery and pain in the norm in the non-West (with the knowledge that much of that has been caused by the West in the past 5 centuries), then uncontrollable depair kicks in- the scale of the problem is already so big thaat nothing can be done about it barring afew parcels of aid... so its good to find hope spots. Like I said, just a few. That's all. p.s: one such hope spot would be a very good friend of mine that has relatives in Kenya. They are fine there and have a good income. Not much you might say, but a hope spot. On poverty, an American living in what would have counted as luxury in the past or in other countries might still be desperately poor in the sense that he is unable to meet his non-voluntary expenses without borrowing or charity, and this can still be true if he sometimes partakes of minor indulgences, because the amount he could save by foregoing them is smaller than the extra amount he needs. Okay, let's back up a second. I was addressing what can be found today, not what hope exists for the future. Today, you will have people complaining about the abject poverty to be found in North America, yet at the same time, today, you can find much worse as a commonplace. Also, one can live quite well in an impoverished country, if one is a professional or has the right hookups. That doesn't mean that the average person lives anything like what we would call an acceptable lifestyle. Speaking specifically of Kenya again, perhaps Geoffrey should ask his friends what they think of the expat Indian community that make up a large part of the entrepreneur class there. He might not hear so much hope. He might even hear some rather discouraging thoughts. Me: "...but without the thesis, antithesis, synthesis, thesis (which is an antithesis of the current synthesis) etc process, everything worthwhile in humans withers." You: "In histriography Marxism is not usually that complex (but sociology, and worse, postmodernism is). "Actually, no, postmodernism is just stupid and self defeating." A society's cultural and intellectual flourishing ('heart' and 'mind') requires a dominant ideology to hold everything together, but that ideology also needs to be challenged and gradually adapting/evolving; fed by a libertarian market place for ideas. So the 'thesis, antithesis, synthesis etc' process is in the broadest possible terms (as the Classical Greeks understood it, a long time before Marx slapped a label on it... I only mentioned him - negatively - to forestall any misunderstandings). Without this, the culture and intellect stagnates, and stagnation is slow - and guaranteed - death, as we all know, really. What it does is illustrates the problem: In the past, some crazy intellectuals would have come up with something like this, there would have been a battle in the market place for ideas, and the peasantry would have ridiculed the idea... it never would have caught on. Without a meaningful market place for ideas, we have seen the monopolistic process of postmodernism coming along, an 'intelligentsia' too stupid and easily led to be able to even understand it, let alone challenge it, this being (incorrectly) fused with Political Correctness and (through academia and the mass media) being peddled as self-evident Truth (ironically) that it is heresy to disagree with (enforced 'softly' but *very* rigidly... as in 'disagree, even sightly, and your career's over'). The idea goes from conceived to being fully internalised by practically everybody (though almost never actually understood, or even explained) almost immediately. In short, every Lyceum and Academy needs an Epicurean Garden in opposition; every Plato, Aristotle and Alexander The Great needs a Diogenes to keep them humble and on their toes. Sorry Rick for the ramble and triple-post: one of those things was my fault. No problem! I got rid of the dupes. I doubt there were political scientists or philosophers who paved the way to the future back then (they probably would have been thrown to the wolves, or put to useful work on a farm....), rather a sort of evolutionary response as whichever system survived the cataclysms the best continued on and spread. Now there are plenty of people who will tell you that our current "politically correct, multicultural welfare state" is being challenged by China, the Islamofascists, the TEA party movement, or aliens from space, and in a way, they are correct. Trade and economic power will flow to whatever society can produce real wealth, goods and services, and economic power is the muscle behind military power as well. This isn't the neat process that is outlined in the Hegelian dialectic, but raw dynamics better modeled in an ecosystem model. Sorry, but I gotta beat up on you for 'Islamofascists,' which strikes me as one of the lamest terms of opprobrium to come along. Just in case we didn't know they're bad, we gotta call them fascists? As I've argued here before, 'fascism' should be limited to political movements that feature color coded shirts and torchlight parades, and preferably some actual historical connection to Mussolini. "Islamofascist" is a fairly common term and easier to recognize than "really, really bad guys who live in caves far away and wish we would join them in the 7th century". Fascism, to be correctly political, is a subvarient of Socialism where the State controls the economy by determining the outcomes (through taxes, regulation, and state intervention (usually purchasing). Color coded shirts are nice to see who is or is not on your side (and hordes of Brownshirts parading down your street or "protesting" in front of your house or place of work does tend to make you see things their way), but fashions change like everything else. It would be a linear fallacy to extrapolate shirts or hats on todays Fascists based on the dress codes of the 1930's ;). "Fascism, to be correctly political, is a subvarient of Socialism..."
Depending on which historian you ask. Thucydides said:"...but fashions change like everything else. It would be a linear fallacy to extrapolate shirts or hats on todays Fascists based on the dress codes of the 1930's ;)." I have my own opinions on Trotsky, the Rosenbergs, and a host of other subjects of burning interest during the mid 20th century. Do you really want me to start talking about that kind of stuff? I had a rather interesting conversation with my daughter the other day about Lady GaGa; she believed Lady GaGa essentially sprang from the ground, but I could eventually trace the sequence from Garry Glitter, through various Glam Rock stars to today.